247 Membership Roll. 1947-1948 Mrs. Pearl Jacobs, 403 West St. Tel. 2528 Miss Beulah Sparks, 526 Broad Mrs. Theodor Olson 532 Broad Tel. 2646 Mrs. Helen Wilson (Mrs. A. T.) 917 Center St., Tel. 3541 same Mrs. Pearl Jacobs 403 West St. Tel. 2528 1948-1949 Mrs. Arnold Sevenbergen 816, 1st Ave. Tel. 451 Tel. 4518 Mrs. Ed. Wright Sr. 504 Main Tel. 3710 Mrs. Ida Klootwyk 1311 Davis Ave. Tel. 2390 Mrs. Iva Peet (Mrs. C. L.) Died Mar. 25-1950 1232 Broad St. Tel. 1224 Mrs. Hazel Sarver (dau. of Peets) 1232 Broad st. Tel. 1224 Mrs. Regina Holland, Tel. 178 (Mrs. S. Ray Holland) 1205 Summer Mrs. Florence Williams Died 26 of July 1949 Not in phone book 615 Broad. Tel. 3307 Mrs. Ed. Adams - 817 Prairie - Tel. 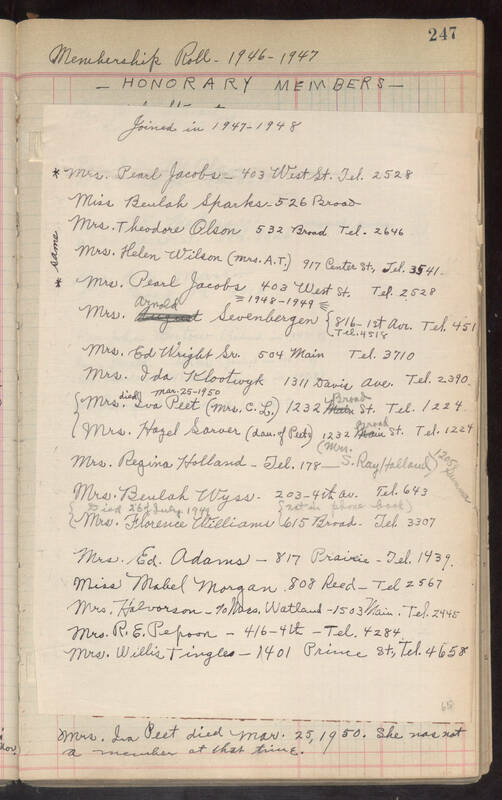 1439 Miss Mabel Morgan 808 Reed - Tel 2567 Mrs. Halvorson - c/o Mrs. Watland - 1503 Main. Tel. 2445 Mrs. R. E. Pepoon - 416 - 4th - Tel. 4284 Mrs. Willis Tingles - 1401 Prince St., Tel. 4658 65 Mrs. Ira Peet died Mar. 25, 1950. She was not a member at that time.